The Peugeot 308 SW is available with a wide choice of modern, high performance, economical and environmentally-friendly power trains. Eleven are on offer in total, to meet the requirements of the widest possible customer base. Five petrol engines, from 70 to 128 kW (~ 95 to 175 bhp) including a �BioFlex� option and three HDi diesel engines, including two which are fitted as standard with a Diesel Particle Filter System (FAP). They are available with either a five speed manual gearbox, four speed automatic or an all new 6 speed manual gearbox. The interior and the design of the fascia panel, identical to that of the hatchback create a sense of well-being entirely in keeping with the overall design of the passenger compartment. Its sloping design and fl owing lines, its elegant and impressive styling, reinforces the impression of space and on board comfort. 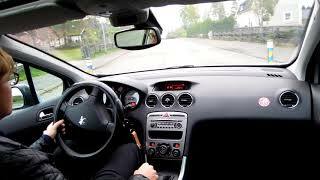 A key feature of the concept vehicle and the interior ambience is the impressive panoramic glass roof, which on the Peugeot 308 SW now extends beyond the heads of the second row passengers, and can also be enjoyed by the occasional occupants of the third row seats. It increases the total glazed surface area of the vehicle to 5.58 m2. 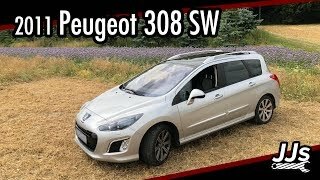 Just a few months after the launch of the new 308 hatchback into the medium car segment, Peugeot now presents the SW version. The Peugeot 308 SW was first unveiled in the form of a concept car at last year's Frankfurt Motor Show. It builds further on the appeal of the 307 SW and estate versions, whose attractive and innovative packaging has won over the hearts of nearly 900,000 customers in the six years since they fi rst appeared on the market. The 307 SW is a unique and original concept which combines a number of strengths such as driving enjoyment, onboard comfort and convenience, comprehensive equipment levels and good load carrying abilities. Since its launch it has been very well received by the car buying public. It has been especially successful with individuals who for practical reasons, found that a hatchback vehicle lacked a certain something and were uninspired by the design of M1 segment MPVs. A public who also required space and practicality for their leisure activities, interaction and user-friendliness, but above all wanted a vehicle with great visual appeal and driving enjoyment. Like the 308 hatchback, the SW capitalises on all the strong points of the "T7" programme : The semi-tall architecture ensuring greater interior space, interior brightness and visibility, a strong stylistic identity, perceptible quality and meticulous attention to detail, all combined with road holding and safety of the highest order. 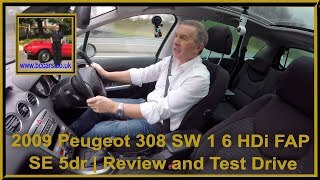 The Peugeot 308 SW also benefi ts from many of the features of the original SW concept car which guaranteed the success of its predecessor but, develops them even further. For example, the panoramic glass roof is now 27 % larger (Total area of 1.68 m2), the modularity is easier to operate and improved and it now has a very practical large opening rear tailgate glass� All these new developments will help to meet even the most diverse requirements and lifestyle situations of its users. Benefi ting from all of these features, the 308 SW does more than just maintain a level of driving enjoyment it extends it in many different ways. The exterior design, of the Peugeot 308 SW succeeds in combining a particularly expressive and dynamic design at the front, which it shares with the 308 hatchback, with an original and curvaceous design at the rear. The low interior noise levels are another feature which helps the comfort and convenience inside the car. It also considerably enhances the overall comfort levels of the passengers and their ability to talk easily between themselves. Particular attention has been paid to the vehicle's modularity so that it can be adapted simply and effi ciently according to the requirements of its occupants. For example, the rear seats in the second row are all individual, easy to remove, identical in size and, therefore, offering a multitude of combinations in the passenger compartment. Also in the "7 seat" confi guration two occasional seats are fi tted in the third row. These seats, however, when required can be folded and with the second row seats folded as well, create a fl at fl oor which makes loading of bulky items much easier. Access to the load area via the wide tailgate or the opening rear tailgate glass is made much easier by the clever design of the rear load cover. The particularly low load sill also makes it easy to load the vehicle which can accommodate up to 674 litres (equivalent volume of water) (or 573 dm3 according to the VDA standard) under the rear load cover with the second row seats in place. With the seats removed it provides a total volume of 2 149 litres up to the level of the roof (1 736 dm3 VDA). In the load area, one of the load area lights is also a portable torch; an indication of the attention to detail that enhances further the car's practical features. The load volume can also be increased further by folding forwards the back of the front passenger seat into the 'shelf' position, and then the Peugeot 308 SW can accommodate loads up to a length of 3.10 m.
All the driving enjoyment of a hatchback With regard to road holding, the wheels and suspension of the 308 hatchback have been revised to meet the special requirements of the SW version. Electro-hydraulic power steering provides the driver with good steering precision and feel. This precision is also assured by the design of the McPherson type front suspension and by the use of a torsion beam at the rear. In addition to the wider front and rear tracks, the fi tment of larger tyres (up to 18'') and a lower centre of gravity than the 307 SW, help to improve the overall dynamic performance. 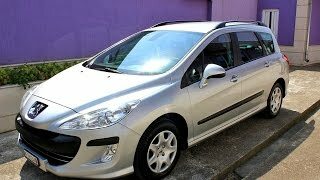 Benefi ting also from its excellent body rigidity, the Peugeot 308 SW provides the best possible combination of road holding and comfort and, therefore, is as much fun to drive as any hatchback. The Peugeot 308 SW is available with a wide choice of modern, high performance, economical and environmentally-friendly power trains. Eleven are on offer in total, to meet the requirements of the widest possible customer base. Five petrol engines, from 70 to 128 kW (~ 95 to 175 bhp) including a "BioFlex" option and three HDi diesel engines, including two which are fitted as standard with a Diesel Particle Filter System (FAP). They are available with either a five speed manual gearbox, four speed automatic or an all new 6 speed manual gearbox. The use of the latest technology in both the petrol and diesel engines, combined with the car's effi cient aerodynamics, weight saving measures and the use of new Michelin Energy Saver tyres, fi rst introduced on the 308 hatchback, give the Peugeot 308 SW an improved environmental effi ciency compared to that of its predecessor. Its fuel consumption, compared to similar engines, can be up to 10 % less than the 307 SW. In addition to the primary safety guaranteed by its exemplary road holding, the Peugeot 308 SW offers a range of equipment such as the Lane Departure Warning System (LDWS) and directional bi-Xenon headlamps. With regard to secondary safety, the structure (thanks in particular to the presence of three impact absorption structures) has been designed to provide optimal protection, combined with the ability to absorb the maximum amount of impact energy in a controlled manner. In addition, the SW can be equipped with up to 7 air bags, including a steering column air bag. Tertiary safety is assured by the «Peugeot Emergency» service linked to the vehicle's RT4 telematics system, which can pinpoint the vehicle's location and trigger the dispatch of appropriate assistance as required. A major innovation is the use of a "Wifi " seatbelt sensor system that assures the fasten seat belt warning function is even available on the removable second row seats, without any compromise on their modularity. The Peugeot 308 SW range, which will differ between individual countries, will consist of five trim levels between now and the summer of 2008. The entry level will, however, take the place of the "Estate" version of the 307 range. It will be fitted with a traditional steel roof and a folding rear bench seat, and will be aimed at customers mainly in search of an accessible vehicle with lots of space. Finally, available in ten exterior colours, several different interior trims combined with either cloth or leather based interiors, the 308 SW range will have a version to appeal to the most demanding customers.